Discussion in 'Missions Center' started by bljkr, Jun 28, 2014. Just a centralized place for commonly used resources and tools for figuring out the clues, puzzles, etc. Please add new ones you come across. Ventus, Nattfasa, Insanity and 32 others like this. Can I make a suggestion? Instead of the rot-n link, which has to be repeated over and over if you don't know how it's encoded, use Mobilefish's Rot-N since there's a button to decode using every cipher. Updated with Nikel's suggestion, kept both or posterity's sake. Added quipqiup link it is a substitution cipher solver in the real sense won't help with more advanced forms but for simple ciphers it works well. Added a Stenography Tool & Hexeditors. There are indeed, not always handy in terms of switching between computers/programs/etc but when on the run definitely handy. These are the ones I have (there are quite a few converters etc) which are for IOS, sorry don't have any android devices. If you use Chrome, there are extensions for reverse image searches. I use the one from Google, but there is one for TinyEye as well. Just right-click the image and select from the menu. https://oeis.org/ is a good site for identifying number sequences. 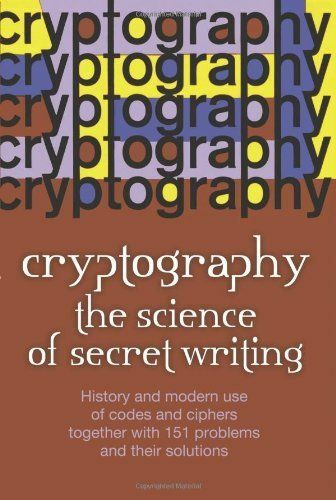 This book is not a book on modern cryptography but it's all about old school code breaking and making. It was written in 1943 (hmmm what was that thing going on in 1943) and so it has quite a bit of historical information as well. Only 113 pages of instruction and the rest are puzzles. I picked it up for $6 used. For 6$, 113 pages would make a cool little side-reading. Neat find! What a neat find. Envious! I can't speak for older versions of IE, but it worked properly in Firefox, Chrome, Safari, and IE 11.0. The conversion box is several scrolls of the page down, and there are quite a few ads on the page in general, I don't usually notice them because of adblockers, but did appear to be working. Someone smarter than me can move this please to where it should best be. Great resource source! I can vouch for this. It's what I go to, particularly while Paulschou's been down and so unreliable for a while. Rumkin's easy and usually successful. For the sake of adding, http://home.comcast.net/~acabion/ has a lot of various resources for more manually solving things, but I've yet to fully investigate. CrypTool-Online is very useful and awesome. You can download the full version free, but their website is an online version if you aren't interested and while some things aren't yet fully available on it, you can still encrypt and decrypt from a very wide resource of ciphers. It's helped me and my newb self out a lot. Towards the top of the page is societies by countries, which I found interesting. You can reverse your string or word only using http://stringreverse.com. This is Reverse Text Generator tool. Might I suggest you also include Google Voice, it allows free calls to America online, which is useful if you are, say, in NZ and don't have a home phone?